for $4,795,000 with 5 bedrooms and 5 full baths, 1 half bath. 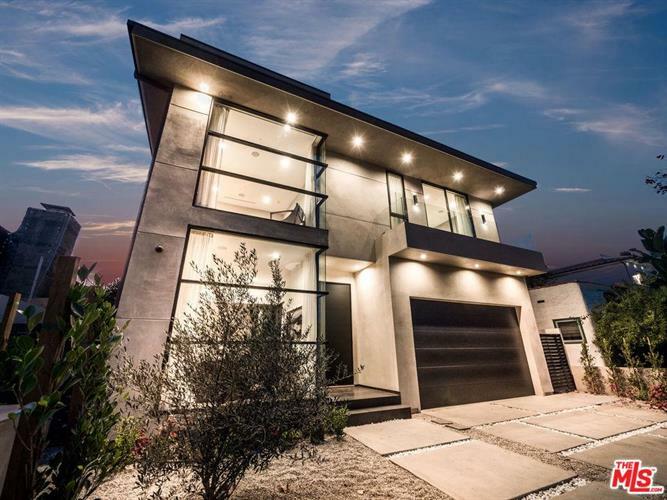 This 5,250 square foot home was built in 2019. Ultra modern new construction smart home in prime Beverly Grove. Boasting 5 bedrooms, 5.5 baths including an expansive master suite with a grand walk in closet and luxurious master bath with superb finishes through out. An entertainers paradise with a movie theater, spectacular Hollywood Hill views from the rooftop deck, built in bbq, private and hedged back yard pool and spa, floor to ceiling windows, pocket doors, 3 fireplaces, Miele appliaces, sub zero fridge, elegant stone counter tops, hardwood floors and with over 5, 000 square feet of living space. With Control 4 Home already installed, you can control lighting, sound for every room and rooftop deck, security, cameras, video and movie theater at your finger tips - compatible with spoken technology systems. The Ultimate Smart Home. Near Melrose Ave/Place, the Design District, Beverly Hills and The Grove.